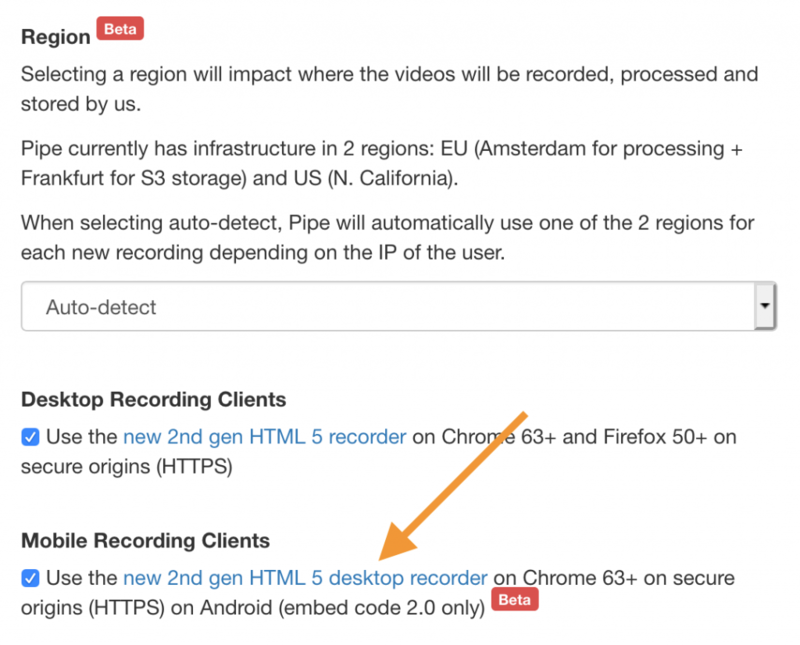 Pipe’s HTML5 desktop recorder can now be used inline on Chrome 63+ on Android devices. The move is part of our effort to provide desktop like inline recorders on mobile devices. Safari on iOS is next. Even though it might seem like a small incremental change to support Chrome on Android as it already worked if you requested the desktop version of a site on mobile, this was actually a big technical change. We’ve taken great care to make sure all these cases are correctly handled and you’ll find the details of what happens in each case below. Since we’re not handing over the recording to the OS, we’re now also able to solve one of the most frequent complaints we’ve had with the native (HTML Media Capture) recorder: being able to limit the recording length. Because underneath it is the same recorder like the one we use on desktop devices you will also be able to use the desktop JS Control APIs and JS Events APIs. These were previously available only on desktop devices with your mobile implementation. You can enable the new desktop recorder on Chrome on Android from your environment settings or when creating a new environment. The HTML5 desktop recorder for Chrome on Android is only available when using the 2.0 embed code. We’ll be recording portrait video when the user holds the phone in portrait mode and landscape video otherwise. Any other requested resolution will be rounded up to the nearest neighbor from the supported list, i.e a resolution request of 400×300 will actually be set to 640×480. As far as we can tell this is a hardware/Android limitation. You can find out the resolutions supported by your browser/device with this camera resolution finder tool. To avoid black bars in portrait mode you’ll need to specifically set your recorder size to a 3:4 aspect ratio but if you do that you might have a poor experience while in landscape. We generally consider black bars to be unavoidable with responsive layouts across all screen sizes and orientations. From Chrome on Android, we’ll be recording using VP8 video and Opus audio in .webm files. The data is converted to H.264 video and AAC audio in .mp4 files on our platform. We’re recording portrait video when the user holds the phone in portrait mode and we’re switching to landscape video if the user rotates the device while the recorder is in idle mode (not recording). If you rotate the device while recording results might vary. 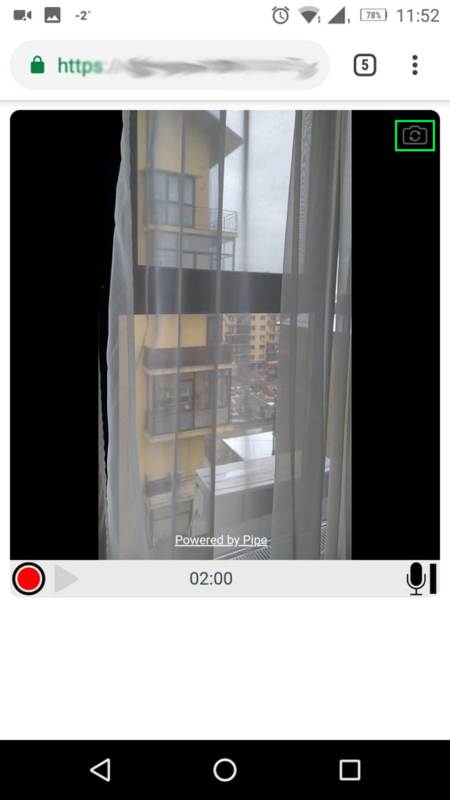 If while recording you receive a phone call, the recorder will continue to record just the audio during the phone call and the video will be a black screen or the image will remain still. After the phone call, the recording resumes as normal. The same thing happens if you don’t take the phone call while the phone UI for accepting/rejecting the call is shown. If you switch applications during recording or even if you bring up the app switcher, the recorder will continue to record just the audio while the video will be black or the image will remain still. After switching back to the browser, the recording resumes as normal. Closing the Chrome tab or closing Chrome altogether will count as a disconnect. If you close the Chrome tab/app while you’re recording and the recorder has the autosave on, Pipe’s recording recovery mechanism will spring into action, it will recover the data that has reached our media rever and will add it to your account’s list of recordings. The recorder will work when opened in the in app browser (for example in Gmail, Twitter, Facebook or Slack) as long as you choose Chrome as your in app browser. As far as we can tell this is not possible at this time. The 2nd tab that tries to get camera/microphone access fails to get any actual video/audio data while recording in the initial tab freezes the image because of tab switching.